Send in your H&M application for a chance to work for one of the most popular clothing retailers in the entire world. The Swedish brand has become a worldwide success due to its unique style, its accessible prices, and its frequent guest designer lines. So, if you are passionate about fashion and always abide by the latest trends, then apply for one of the amazing H&M careers. Here is a guide that will help you do just that – apply, fill out the online form and ace your interview. Submit your H&M application today! Go to the H&M official careers portal, career.hm.com, to find everything from exciting positions in H&M stores to posh H&M careers in the corporate sector. You can always find the newest job openings posted there so make sure you check it periodically. Here are some examples. If you want to know more about the current H&M job opportunities, go to the official H&M online careers portal, career.hm.com. Go to the Before You Apply section and take the H&M employment quiz to find out if you are going to be a good fit for their team. It will only take you a few minutes to go through and you will receive feedback after every question so that you can get an idea about how things are done in H&M stores. Read their tips for applying at H&M, for the hiring process and for the interview to maximize your chances of success. Then, when you have a clear idea about what you are facing, take a look at the available positions. Put in a keyword, your location and your desired field of work and analyze your options by reading the full job descriptions. When you find a position that you are excited about click on the Apply button to begin filling out your H&M application form. 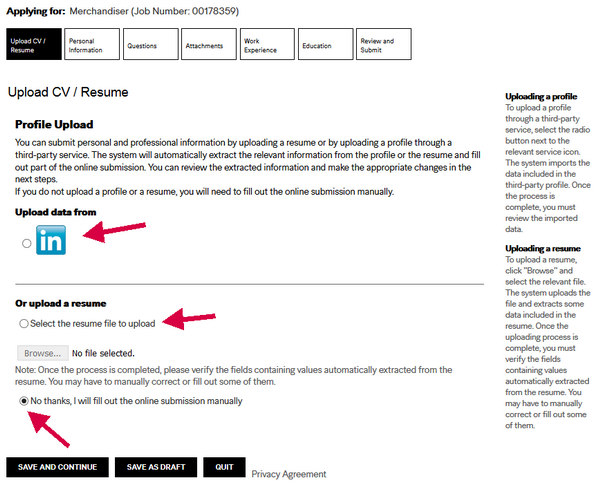 Provide your resume for the H&M application form either by uploading it from your computer or from your LinkedIn profile. The main information will be transferred from your CV directly to the appropriate fields. However, if you are not able to supply a resume, you are given the option of filling out the form manually. Provide your resume for the first section of the H&M application form. For this section of the H&M application form, you will have to provide your complete contact details, so that the Human Resources department can get in touch with you later on. You will also have to mention if you have ever worked for the company before and the date you are available to start working at H&M. Take your time to provide a complex answer for the last question in this section of the H&M application form. Lastly, you will have to answer a typical interview question, “What is your reason for applying at H&M?”, so that the hiring specialists can get an idea about your objectives at the company. This section of the H&M application form includes the two most important pre-employment questions. 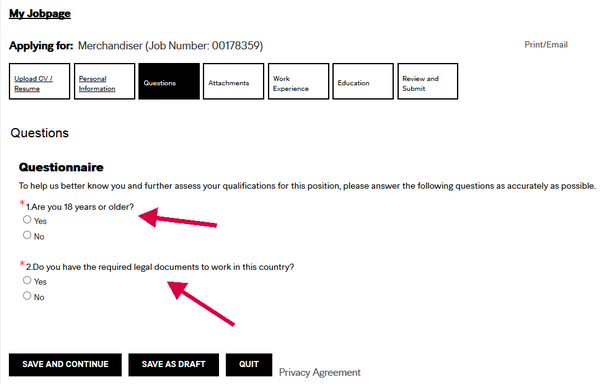 They are meant to assess whether or not you meet two of the main hiring criteria: your age and legal right to work in the U.S.
Answer these two employment questions for this section of the H&M application form. 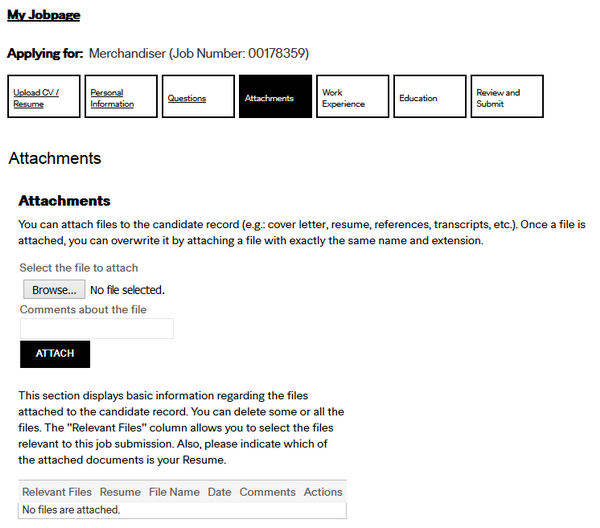 Upload any additional document that you think could improve you H&M job application form for this section. This means that you can add anything from a cover letter to diplomas, transcripts, and references. Upload all the additional documents of your resume for this section of the H&M application form. As you can see in the picture below, you will only have to include the name of the company where you have been employed, the position you held there and the duration of your collaboration with the company. This data will be transferred from your resume to your H&M application form if you upload one. 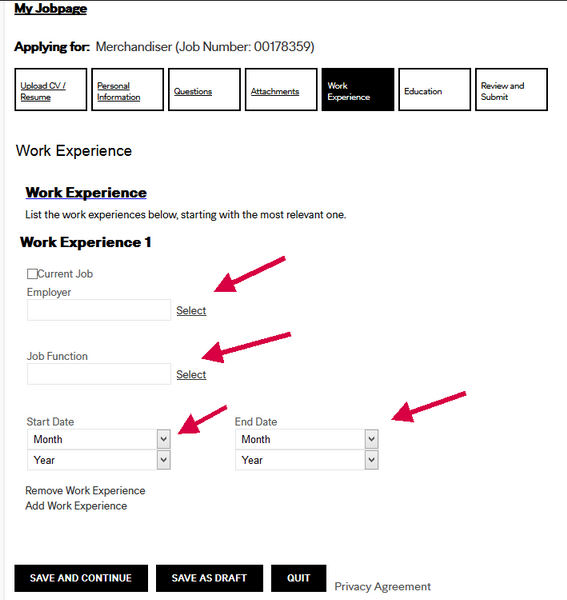 List your past workplaces for this section of the H&M application form. 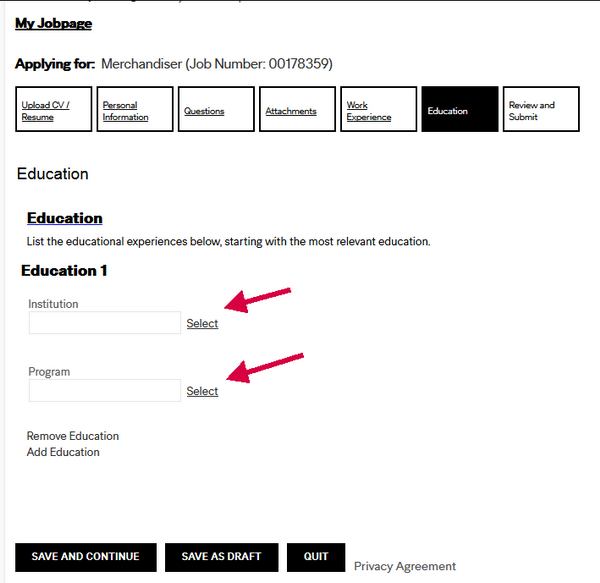 The Education section of the H&M application form only requires you to list a brief outline of your academic experience, so you should be able to go through it quite easily. List the main points in your education history for this section of the H&M application form. Before you submit your H&M application form, take a few minutes to read it once again and make sure that you have mentioned everything you want and that there are no spelling and grammar mistakes in your form. In this section we look at some of the more popular H&M job openings. Each job opening comes with a H&M job description and information on salary, requirements and responsabilities. This is the main entry-level H&M career because the employees become experts in H&M products and learn to work as part of the team. They will make sure that the customers have the best possible shopping experience at the store by providing them with all the advice they need. You must have graduated from high school or have an equivalent degree. H&M requires all candidates to have at least six months of experience in retail or other type of customer service. You need to be able to climb a ladder, lift 20 pounds, and engage in strenuous physical activities. Keep in mind this is a physical job. The starting pay for this H&M job is $9.00 per hour and it can get as high as $14.00 per hour as the employees gain experience in the position. It can be either part-time or full-time. A Department Manager at H&M is responsible for sales maximization, department profitability, and customer service. He or she may also be in charge of coaching employees within their department. However, the most important thing you will have to do is to develop your team. Therefore, you will be seen as a mentor/manager. You must have a high school diploma or a valid equivalent. Apart from that, H&M will always prefer candidates who have a Bachelor’s Degree or an Associate one. You also need to have between two and three years of experience in the field to qualify for this position. The same physical abilities apply as for the Sales Advisor position. The total compensation for a Department Manager at H&M is $52,000 per year. Employees may also receive commission sharing or cash bonuses. The typical working schedule depends on the store’s location as well as on the time of year. A Visual Merchandiser is supposed to liaise with the store’s management so as to maximize its sales, coach the Sales Advisors so that they can teach them everything they need to know and identify talent for promotions. As far as education goes, H&M prefers all its Visual Merchandiser candidates to have at least an Associate’s degree when it comes to the fashion industry. They must also have at least two years of experience in visual merchandising, as well as the physical abilities we mentioned above. The annual salary for a Visual Merchandiser at H&M is around $33,000. Employees may also receive bonuses in cash or stock. This can be either a full-time or part-time job. 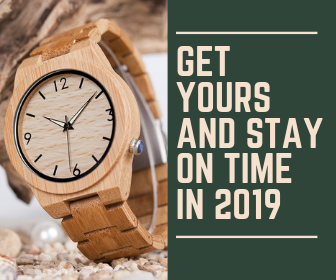 Independently of this aspect, expect long hours and over time, as well as putting in full hours on special occasions, such as Sales, Black Friday or Christmas time. Here are some of the duties associated with this position: managing the process through which floors plans, fixtures, and elevations are created, communicates with different managers to ensure that the projects are seen through, liaising with construction companies and architects to complete or maintain the store’s design, and much more. The candidate for this position needs to have the following minimal qualifications: a Bachelor’s degree in Architecture, Interior Design, Industrial Design or any other related field of study, and between three and five years of experience in retail design. A Store Manager has a reported salary of approximately $67,000 per year at H&M. This position can be a part-time or full-time one, depending on the store and its location. H&M healthcare benefits – everything from Medical, Dental and Vision plans to Employee Assistance Programs. Paid Time Off – Holidays, Vacations, Sick Days, Bereavement Leave and Wellness Days. Financial Security – everything from the 401(k) Retirement Plan to a wide variety of Insurance packs. Special H&M employee discount – 25% off any product in H&M stores. Only online applications are accepted, via career.hm.com, the H&M careers portal. Add your resume and cover letter, even if they are not mandatory. Dress in one of the company’s signature styles with H&M pieces. What do you expect from this H&M career? Why do you want to work at H&M? or What is the reason for applying to H&M? H&M also offers a fun quiz on their careers website. The quiz lets you see if you are a match for H&M’s values and principles. You can take it online, and it involves not commitment whatsover. You can take it anonimously before you decide whether to apply for a position at H&M. The quiz is also useful for the H&M interview, as it gives you some insight into the H&M culture, and helps you prepare better for the interview. Typical H&M store hours are 10:00 A.M. to 9:00 P.M. Monday to Saturday and 12:00 P.M. to 6:00 P.M. on lazy Sundays. If you want to be sure, go to the official H&M website, www.hm.com and use the H&M store locator to get the full details. If you work in an H&M store, your work hours will likely differ from H&M open and close hours, as you will likely have tasks to do before and after customers come to the store. 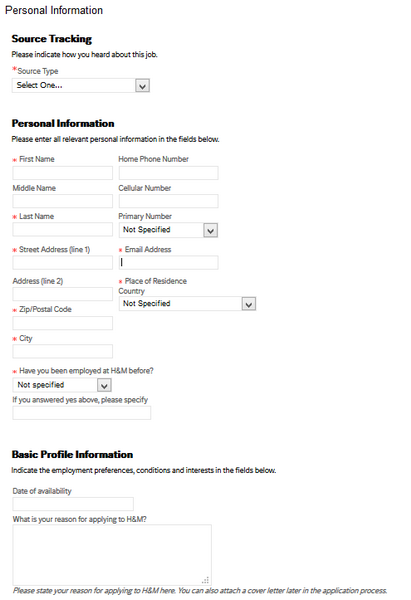 Contact H&M’s human resources apartment, or check your online job application account, if you have one. Use the indications in our guide to apply for a position at H&M. Be sure to come back and tell us how it went! It would be very useful for our readers!